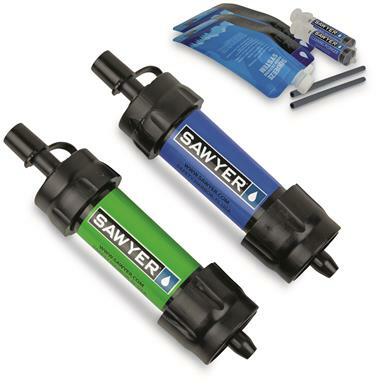 It's one of Sawyer's most popular filters, but now made available in a smaller, lighter form. The Sawyer MINI Water Filter is certified for ABSOLUTE microns, making it impossible for harmful bacteria, protozoa, or cysts like E. coli, Giardia, Vibrio cholerae and Salmonella typhi to pass through. And more impressively, this highly effective filter weighs only 2 oz. and fits in the palm of your hand—making it an ultra-lightweight solution for water on the go. And let's talk versatility. The filter has a built-in push/pull cap, so you can fill the squeeze pouch from the water source, attach the filter and drink directly from it, or use it to filter water into another compatible bottle or hydration bladder. Use the included syringe to backflush the filter for easy field maintenance and to maintain its high flow rate. 10" x 2" x 6", weighs 10 oz. Clean water for 5 without pumping iron. Measures 20" x 14" x 6"w.
Weighs 2 lbs. 14 oz.